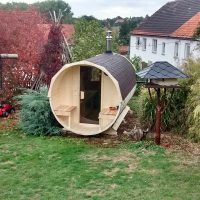 One more option to extend an ordinary sauna and make it more interesting and functional is to furnish it with sheltered outside seats. One can use them for cooling down between separate sauna sessions or for relaxation after finishing his sauna ritual. 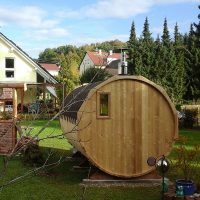 All the saunas are handcrafted by the means of old traditional cooperage technology. 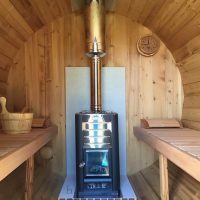 The wooden planks are carefully selected and then tightened with stainless steel hoops, the whole construction is treated with natural tar oil, making our saunas purely eco-friendly. We use only high-quality Spruce and thermally modified wood for construction of our saunas . Spruce has very good thermal conductivity, it is light but still very durable, it has pleasant light colour and good scent. 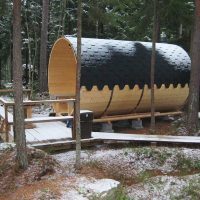 Thermowood makes sauna resistant to shrinkage caused by lack of humidity and extreme temperatures. It eliminates the chance of deformation in case of multiple dislocations of a sauna. 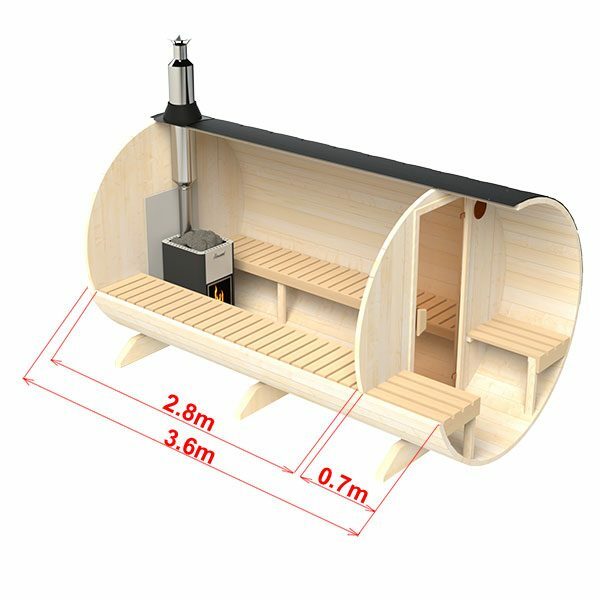 However, separate parts of sauna, such as floor and benches, are made of Alder as it does not get too hot and does not exude resin. 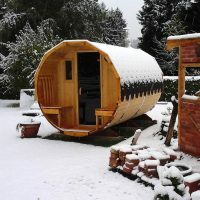 Portability is a significant advantage of a barrel sauna over an ordinary one. 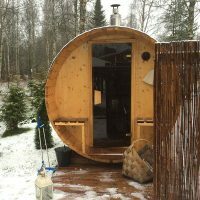 In case you decide to move to another district, city or even country, you will not be forced to leave your favourite sauna. Just place your sauna on a cargo, and take it with you! If you feel that you deserve absolute comfort and want someone to care about every little detail, purchase one of our preassembled saunas and we will deliver it right to your house! 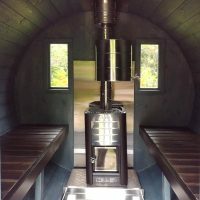 All you have to do in this case is place the stove and enjoy your new sauna!